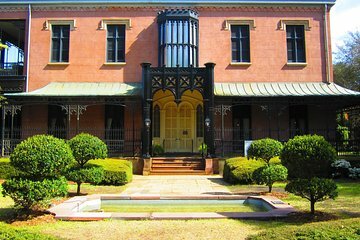 Avec ses rues pavées, ses places historiques et sa pléthore d'architecture coloniale, Savannah est le rêve d'un passionné d'histoire. Découvrez l'histoire de l'implication de Savannah dans la guerre civile - y compris la façon dont elle a été épargnée lors de la Marche pour la mer de Sherman, laissant son infrastructure et son logement d'origine intact - lors de cette visite à pied de Savannah. Informez-vous sur l'implication de la ville dans la guerre civile, et expliquez pourquoi elle a été si épargnée. Mike Mack was a great tour giude who we enjoyed very much. He has a deep knowledge of the subject, good delivery and amicable personality. We definitely recommend this tour! EXCELLENT! Mike Mack customized the tour to our knowledge...and did a great job. He was very professional...and knowledgeable.We enjoyed a great deal. If youre at all interested in the Civil War, this is a must take tour. Mike Mack, tour guide was extraordinary with his knowledge of events preceding, during and post Civil War effects on Savannah. He should be teaching! Orlando was our tour guide. He has the credentials and knowledge about the civil war and gave us an historical perspective but was able to refer it to current happenings in a non confrontational way. I would have liked to hear more about all of the citizens of Savannah and how the civil war happenings affected women and persons of color and not just about the generals and wealthy. Nothing beats a tour with a historian that not only knows every detail of the topic in question but can also interpret the role of events in the US history in general, as well as the history of Savannah. Mike was a fantastic tour guide and impressively knowledgeable. We could not recommend this tour more. Very informative. Good pace. Lots of stories. Was very interesting and really enjoyed the architecture. Wear comfortable shoes and bring water to drink. We had a wonderful time on our Civil War tour with Mike. He was so knowledgable about the subject and could answer any question we had. His delivery was interesting and you could tell he really loved the subject matter and showing visitors the magic of Savannah. Thanks Mike for an enjoyable morning!